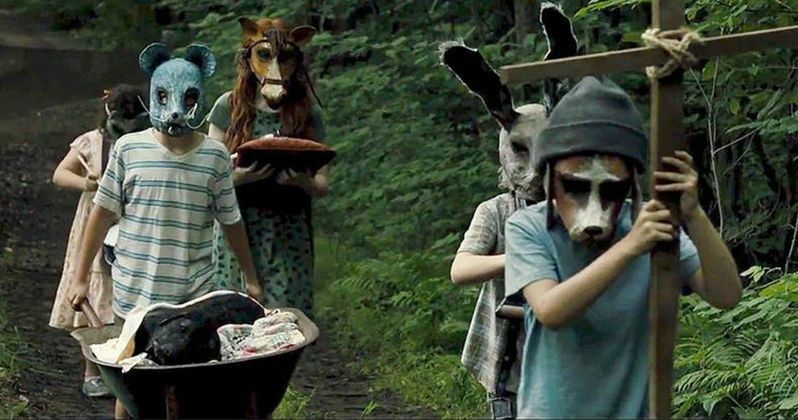 Kevin Kolsch and Dennis Widmyer's remake of Stephen King's Pet Sematary is heading our way next month, and we couldn't be more excited. The movie held it's World Premiere at this year's SXSW Film Festival last week and has been snatching up positive reviews left and right ever since. And for all of you guys out there that may have been worried this new take on King's most terrifying novel might go the PG-13 route, no worries as today the MPAA confirmed that Pet Sematary has been slapped with an R-rating for "horror violence, bloody images, and some language." And thank God, right? I know that spreading the word that Pet Sematary is rated R might not seem like news, but can you imagine if instead of this glorious R-rating we're sharing with you guys today, there had been a PG-13 slapped onto the movie? Mother of God, the backlash. But, no. It seems like Kolsch and Widmyer, along with the powers that be over at Paramount, know that the only way to tell this brutal tale is with an adults-only rating. Again, thank God. This remake is of course not the first adaptation of Stephen King's 1983 novel. Director Mary Lambert adapted the book for the big screen originally back in 1989 with her version starring Dale Midkiff as Louis Creed, Fred Gwynne as Jud Crandall, Denise Crosby as Rachel Creed, Miko Hughes as Gage Creed, Blaze Berdahl as Ellie Creed, Brad Greenquist as Victor Pascow, Susan Blommaert as Missy Dandridge, and Andrew Hubatsek as Zelda. That version was a big hit back in the 80's gathering up a total of $57 million at the domestic box-office all said and done. Lambert followed up that hit adaptation with a sequel called Pet Sematary Two in 1992 which starred Edward Furlong (Terminator 2: Judgment Day), Anthony Edwards (E.R., Zodiac), and Clancy Brown (The Shawshank Redemption, Starship Troopers). The sequel wasn't anywhere near as successful, and to add insult to injury, Stephen King had his name removed from the film before its release. Ouch. This new version of King's classic tale of terror stars Jason Clarke (War for the Planet of the Apes) as Louis Creed, Amy Seimetz (Alien: Covenant) as Rachel Creed, and John Lithgow (Dexter) as Jud Crandall. They are joined by newcomers Jeté Laurence as Ellie Creed, Hugo Lavoie and Lucas Lavoie as Gage Creed, Obssa Ahmed as Victor Pascow, and Alyssa Brooke Levine as Zelda Goldman. Kolsch and Widmyer (Starry Eyes) direct the film from a screenplay written by Jeff Buhler (Midnight Meat Train) based on the novel of the same name by Stephen King. Lorenzo di Bonaventura, Steven Schneider, and Mark Vahradian produce. Christopher Young provides the music for this new version, Laurie Rose handles the cinematography, and Sarah Broshar cut the film. Di Bonaventura Pictures produced, and the movie will be distributed by Paramount Pictures into a theater near you on April 5, 2019. This update comes to us via Film Ratings.